Finally, a security trade magazine is taking a bold stand! Unfortunately, it is in favor of felicide, justified by austerity. UK firefighters saved the life of a stray kitten that got stuck inside a car in the freezing cold. While a local newspaper ran this feel good story, a UK security trade publication, IFSEC Global, scrutinized it, saying "I'm sorry, two and a half hours!? Is this really an acceptable use of Cumbria Fire and Rescue Service's time amid a national picture of huge budget cuts to fire services?" 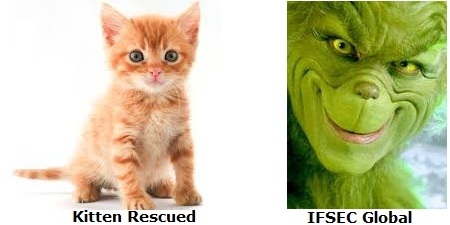 IFSEC Global estimated that saving the cat cost 1,051 GBP or ~$1,600 USD, concluding, "Call me a miserable pedant by all means, but should we really be celebrating this?" Of course, firefighters, are not iPhone factory workers paid piecemeil. Like police, emergency, and security professionals, their shifts are essentially fixed costs, regardless of activity. Unless the firefighters avoided saving human beings in a simultaneous fire, the incremental cost is far far less. More importantly, the Carlisle Fire Department has brought international acclaim to their town. Even if it cost $1,600, the amount of publicity they have received is easily 100 times greater, which can help in tourism and attracting businesses (except for IFSEC who evidently does not want their tax money wasted on saving a kitten from being burned alive inside of a car). It's a real shame that IFSEC chooses to take a stand on this. While they continue to routinely run marketing fluff pieces as news, they let pass the more serious sins of the industry. I guess it's easier for them to pick on stray kittens than risk offending their manufacturer customers. Comments (4) : PRO Members only. Login. or Join.